Looking for a breast cancer awareness ribbon to wear or give as a gift that is unique? Try this handcrafted silver pendant made from vintage US Coins, by Artisan/Designer Jessie Kislin Driscoll. Driscoll cuts and forges a US silver Walking Liberty Half Dollar into this Awareness Ribbon Pendant, to maintain the integrity and elements from the original coin, such as the rising sun, the year (1940), and the words "God" and "Trust." The coin is visible on both sides. 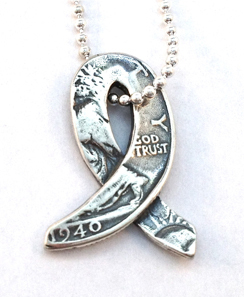 The Awareness Ribbon Half Dollar Pendant is about 1 ¼ inches tall. The Awareness Ribbon is $75 and comes with a plated chain, which is available in 16", 18" and 24". Sterling silver chains are available, in 16", 18" and 20", for an additional $10. Order yours NOW!